With winter finally behind us, and the weather slowly creeping into the warmer temperatures, now is a great time to begin tending to your landscaping. Updating your lawn and garden now will ensure an easier time of updating it throughout the year and allow a variety of plants, flowers, and shrubs to really take hold now, and bloom early in the season. Preparing for weed removal is an especially important aspect of landscaping in the spring when your plants are just starting to grow in warmer weather. As the weather gets warmer and grass begins to regrow, give your lawn a good mowing. Most homeowners tend to mow about once a week. If you would prefer to maintain a certain height of your grass to a single consistent length, it may need to be mowed even more frequently. Typically, your lawn requires a healthy trim once every five days, at least. One of the most important aspects of landscaping is keeping your yard free of weeds. Preparing for weed removal is an especially important aspect of landscaping in the spring when your plants are just starting to grow in warmer weather. Not only are weeds visually annoying, they can very easily affect the health of your plants and shrubs. You can keep weeds away for good by frequently redistributing the soil in your garden, which will also help your plants grow faster and healthier over time. Heading into the new season, it is often recommended to use a good herbicide that is both safe for your garden and effective in controlling weed growth. You can also deter pesky weeds by preparing some plastic with holes cut in where you want your plants to grow to redirect your plants and keep weeds at bay. One common misconception with the spring season is to immediately begin planting grass seed. This is actually most ideal in the Fall, but it certainly is proper to fill in patches and other holes with seed as needed, but begin fertilizing your lawn first. Rhine Landscaping has the tools to make your yard beautiful throughout the year, so trust us with all of your landscaping and poolscaping needs. We have the expertise and knowledge to complete any and all of the landscaping projects on your list. For more information about our services, visit us online or give us a call at (410) 442-2445. For more tips on how to keep your yard and pool looking great year round, follow us on Facebook! 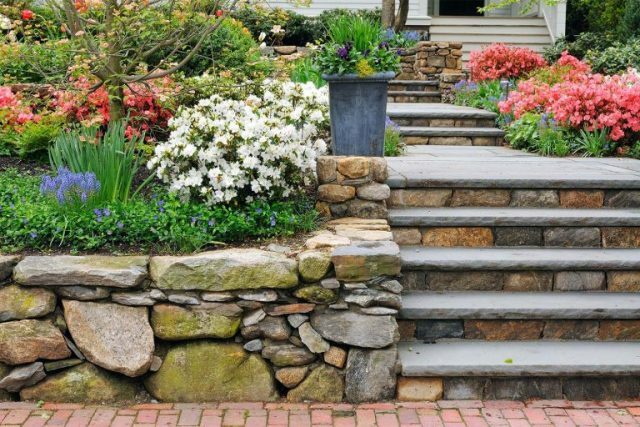 This entry was posted on Wednesday, March 20th, 2019	at 11:14 am	and is filed under Landscape Maintenance, Lawncare, Spring Landscaping Top Tips	. You can follow any responses to this entry through the RSS 2.0	feed. Both comments and pings are currently closed.